Exeter Chiefs' recruitment drive has continued with the signing of New Zealand centre Jason Shoemark from Super 14 side the Highlanders. 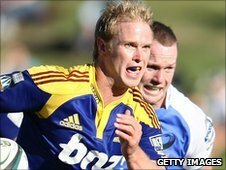 The 29-year-old is a former captain of both the Highlanders and the New Zealand Colts. Exeter boss Rob Baxter said: "Jason could be regarded as one of the best midfield players not to win a full cap for the All Blacks. "He will bring leadership and competitive qualities to our team." He added: "I know there has been an element of frustration with our supporters waiting to see the additions we will make to the squad. "But I would hope that the signing of a player like Shoemark shows that we are taking our time bringing the right players with the right qualities to Exeter." Shoemark will not arrive at Sandy Park until the end of the current league season in New Zealand in November.